I know we are probably not done with winter yet, but I took a bag of summer out of my freezer in the form of corn. It's the very corn I bought last summer. I took the kernels off the cob so I could have that taste of fresh corn when the snow flies. You can substitute corn from the grocery store. 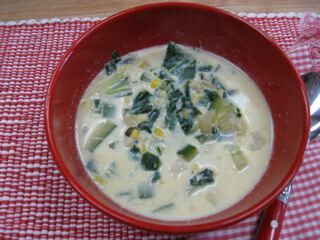 This chowder is packed with flavor from the stock made from the corn husks cobs and a bevy of veggies like zucchini, bok choy and onions. In a soup pot cook the pancetta in the olive oil until the pancetta begins to render its fat. Stir in the onion, bok choy and sweet potato. Stir well, cover the pot and cook until the vegetables begin to soften, about 8 minutes. Stir in the zucchini. Sprinkle the vegetable with the flour and add salt and pepper to taste. Stir in the evaporated milk, heavy cream and reserved corn water. Bring the mixture to a boil, then reduce the heat to simmer and cook for 10 minutes. Correct the seasoning with salt and pepper; stir in the parsley and thyme. Serve hot. Every time I shuck corn I always notice how wonderful the husks smell. I never thought to boil them for stock, and the cobs...so you used both? Dan, yes use the cobs to make the stock. Add the corn when you make the soup.